Super Skin Editor automatically manages the dimensions of each 32pixel x 32pixel frame that compose a skin without the need to resize or fear of frames overlapping another. The editor also draws onto the frames at double pixel size as if the frames were actually 16pixel x 16pixel, simulating the retro-style the game aims to achieve. 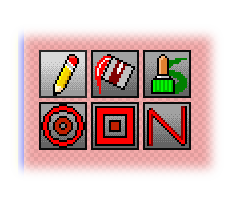 Super Skin Editor has several painting tools available. Each tool has an assigned hotkey for quick access, and several tools have additional hotkeys that modify drawing behavior in various useful ways. Super Skin Editor saves each change you make to the skin as well as recording the initial state of each individual frame. This means that after making several changes to each frame in the images, you may choose to restore a frame back to the state it was in when it was loaded. This action, in itself, is even undo-able. 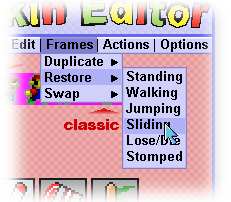 Super Skin Editor boasts unlimited undos, infinitely more than the original quantity of three available in Microsoft Paint. Copyright © 2011 Scott Stutzman, All rights reserved.